Nobody wants to get old – but they don’t wanna die young either. His face is the underside of a running shoe, his voice is weather-beaten phlegm, his fingers arthritic memories, smoke curling from a constantly-lit cigarette. So this is what Gollum is doing now? 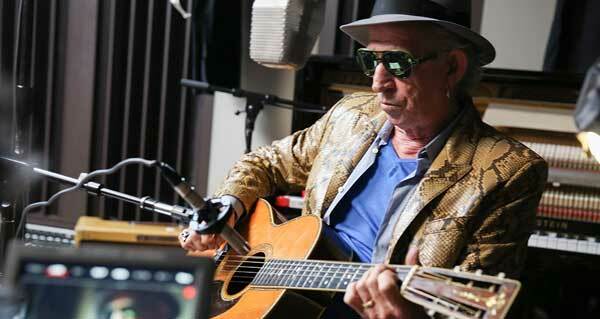 No wait, the guy in this documentary is Keith Richards, guitarist for The Rolling Stones since man invented fire. Director Morgan Neville (JOHNNY CASH’S AMERICA) perches on Keef’s shoulder, watching him insouciantly lay down tracks for his new solo blues album, while telling tall tales: visiting Muddy Waters’ old house, (“It was rockin’ when I got here – it’s leaving I don’t remember…”), working with Chuck Berry (“Chuck has his own way of showing appreciation…”), playing with Howlin’ Wolf (“The gentle giant”), visiting New Orleans concert halls carved from churches (“Beautiful woodwork!” – I thought that was such a funny, inconsequential line – and there it is in the trailer!). Not really a biography, just a portrait of the ageless superstar at this point in time. If you came for the Strolling Bones, you’re in the wrong doc; they are but a peripheral presence, and only because they inform such a large slice of Richards’ life. There is one excellent sequence where we see the young Stones in the studio (circa 1968) fashioning Sympathy For The Devil from a slow Dylan-esque wailer to the ramped tribal samba we worship within pentacles. Doc investigates what influenced Richards (reggae, country, R&B, Johnny Cash, Chuck Berry, Jerry Lee Lewis), what united him with Mick (he recounts that fateful 1960 meeting on the morning train with Muddy Waters and Chuck Berry records tucked under Jagger’s arm), and what drove him to venture out on his own (the rift between he and Jagger in the late 80s: “1985 to ’89, that was actually World War III”). We see an SNL performance of his first single Take It So Hard, from his 1988 debut solo album Talk Is Cheap. Tom Waits is a talking head, Buddy Guy beats him at pool, and there’s a touching segment where Richards reconciles with his dad after two decades. He complains about the white version of the blues, differentiating “rock and roll” from “rock music,” saying he’s losing his taste for the latter, because “they turned it into a march [he groans a plodding song in strict 4/4]. That’s their version of rock. Excuse me, I prefer the roll.” Whatever that means. And the only reason people rub their chins and declare you a prophet – is because you’re Keef! Who you been listening to anyway, turning rock into a “march”? There’s something worthwhile to be found in every song in every genre, from The Backstreet Boys to Black Sabbath, from Barbra to Bach. And I would think someone with Richards’ experience would know that, or would have innately sensed it by now. He has forged some of the most memorable riffs in rock and roll history, but the material we hear him constructing (presumably for his 2015 release Crosseyed Heart) is a stream-of-consciousness potpourri of the same old blues progressions, as he leans his runnelled face up against a mic and rasps the same old blues lyrics about whiskey, women and blind lemon pie. No one is saying Richards is not good, or that the album might not be stellar, but this solo Stone is given a lot of undue credit simply for being alive after ingesting every drug in the universe. He’s just playing 12-bar blues, people. It ain’t heart surgery! And though there IS edification in hearing good blues played by great musicians, even the best artists in that genre soon start repeating themselves (to wit: Keith Richards). That’s my biggest gripe with the blues: from the tonal modes to the fretboard positions to the facial expressions – repetitive repetitive repetitive repetitive repetitive repetitive… But it doesn’t have to be! Richards’ own output is a marvel of blues-BASED ditties that colors outside the 12-bar framework (Gimme Shelter, Angie, Sympathy For The Devil, Brown Sugar, etc. ), so why the constant reversion to this simplistic, BORING form? Yeah, I said it. Richards is regarded as a god, even though there are so many others who are more prolific, more creative (Todd Rundgren, Frank Zappa, Prince), who push the boundaries of music past where they found it, whose originality gives us chills. Keith Richards comes off as a really nice guy, still sharp and funny, and appreciative of his musical life, and though the cig never leaves his lips, we presume he is straight as an arrow these days. Or he wouldn’t be alive! So that title is kinda cheap: Under The Influence – like he’s still a Badboy, with a horse needle in his arm and drinking straight from the Jack bottle and puking in a gutter and spending the night in jail after a gig. He even has a chuckle about that perceived image of him. Then why that title? His joy of life is unquenchable, his laugh is infectious. His wife of 32 years, Patti Hansen, is still hotness. His property is lush green acreage. He’s a multi-millionaire. And he’s a Rolling Stone. Why is this guy singing the blues again? Starring: Keith Richards, Steve Jordan,Waddy Wachtel, Tom Waits, Mick Jagger, Muddy Waters, Ron Wood, Bill Wyman, Charlie Watts, Rolling Stones, Buddy Guy, Howlin’ Wolf, Chuck Berry.